The continual advancement in consumer electronics leading to increasing consumer spending for ownership of newer electronic devices is the major factor propelling the global tin market. Tin is of the key metals used in the manufacture of consumer electronics, with over 50% of the tin used for welding. Furthermore, the growth of the packaged foods industry due to changing lifestyle in also favoring the growth of the tin market. Both these industries are displaying significant growth predominantly in emerging economies due to growing consumerism among the rising middle-class population in these regions. In addition, the potential application of tin in solar power generation is expected to present ample opportunities to the market’s growth. However, tin production and consumption is expected to display a demand-supply gap in the coming years. The high-paced industrial growth and urbanization in the emerging economies of Asia Pacific and Latin America is expected to outpace tin production in the near future. Depleting resources in major mines in Brazil and Peru is expected to hit tin production, which in turn, will affect the growth of end-use industries globally. At the same time, new pipeline projects for tin production are not expected to commence before 2024 to top off the demand-supply gap. As a result, the severity in tin supply shortfall is only expected to increase over the coming years. Pipeline projects might cater to the demand in future, but for now, the rising demand will not match with the reducing supply. The global tin market is projected to rise at a CAGR of 3.4% between 2015 and 2023. The market stood at US$7.4bn in 2014 and after a short period of dip, it is projected to reach a valuation of US$7.29 bn by 2023. By volume, the global tin market is anticipated to rise at a CAGR of 2.5% from 2015 to 2023. Accounting for a slight over 67% of the global volume of tin, Asia Pacific stood as the leading regional market for tin production in 2014. A major chunk of tin consumption goes for welding in the electronics and transportation industries. The region is expected to display a high rate of activities for both production and consumption of tin. China is expected to display the leading consumption of tin in Asia Pacific due to a flourishing consumer electronics industry. Latin America is expected to display steady growth in terms of tin consumption in the coming years due to the expeditious expansion of food and beverages and semiconductor industries in the region. Europe stood as the second-largest region in terms of tin consumption in 2014, however, the region is expected to display a declined demand for tin in the coming years due to the progression of Eurozone crisis. Consequently, the increasing unemployment and weakened consumer confidence will be detrimental to the growth of the regional market. North America is expected to display moderate growth in terms of tin consumption as the U.S. will continue to display steady growth in the consumer electronics business. The application areas of tin include soldering, chemicals industry, glass manufacturing, tin plating, and brass and bronze manufacturing. Of these, soldering is the leading application segment and is expected to rise at a CAGR of 2.9% between 2015 and 2023 in terms of volume. This is because soldering is a core component in most semiconductor-based industries for high durability and reliable connection of components. Tin being one of the key components of soldering alloys is needed in large quantities in semiconductor devices. The tin plating application segment is expected to display substantial demand due to the rapid growth of food and beverages packaging industry. Some of the key producers in the global tin market include Thailand Smelting and Refining Co. Ltd., Yunnan Tin Group Company Limited, Guangxi China Tin Group, and Empresa Metalúrgica Vinto S.A.
Tin, a part of the carbon family, shares chemical similarities with germanium and lead. It is highly malleable and ductile and is capable of being transformed into thin sheet. Tin is unaffected by oxygen and water at room temperatures. It does not corrode or rust easily; hence, tin can be used as a coating material to protect other metals. Expansion in the consumer electronics industry coupled with rising demand in the food packaging industry is expected to drive the tin market during the forecast period. Additionally, its potential application in the solar energy industry is anticipated to provide ample opportunities for market growth during the forecast period. The production of tin is concentrated in emerging economies of Latin America and Asia Pacific. Currently, China, Indonesia, and Peru are the largest producers of tin in the world. Indonesia, one of the largest producers of tin, is tightening its rules for tin exports in order to crack down on environmental degradation and smuggling. Myanmar is also anticipated to emerge as a major supplier of tin in the world in the near future. This study analyzes, estimates, and forecasts the global tin market in terms of volume (kilo tons) and revenue (US$ Mn) from 2014 to 2023. Market numbers given in the report describe the global demand for tin, but not the production or supply. The tin report also analyzes several driving and restraining factors and their impact on the market during the forecast period. 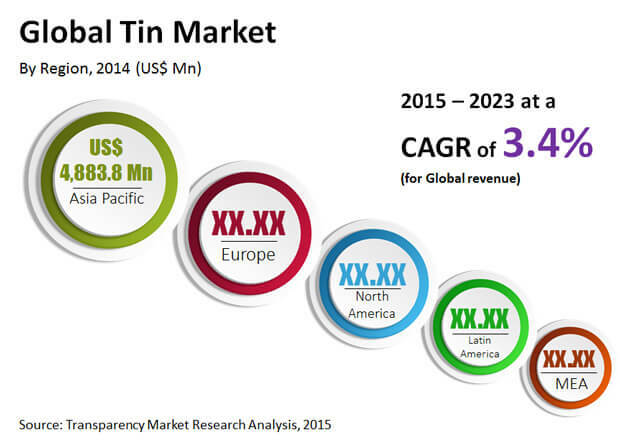 The report provides detailed analysis of the tin market by key applications. It segments the market into the following key applications: soldering, tin plating, chemicals, brass & bronze, glass, and others (including lithium-ion batteries, ammunitions, and solar cells.) The report also segments the market based on major geographies into North America, Europe, Asia Pacific, Latin America, and Middle East & Africa. It further provides volume and revenue for each application segment for each region. This includes 12 unique country-specific analysis. Based on application and country, the report analyzes the attractiveness of each segment and country with the help of an attractiveness tool. The study includes value chain analysis, which provides a better understanding of key players in the supply chain from raw material manufacturers to end-users. Furthermore, the study analyzes market competition through Porter’s Five Forces Analysis. Key market participants profiled in the study include Yunnan Tin Group Company Limited, Thailand Smelting and Refining Co., Ltd. (Thaisarco), Yunnan Chengfeng Non-ferrous Metals Co., Ltd., Guangxi China Tin Group, Malaysia Smelting Corporation, PT Timah (Persero) Tbk, Minsur S.A., Empresa Metalúrgica Vinto S.A., Metallo-Chimique International N.V., and Gejiu Zili Mining And Smelting Co., Ltd. Profiles of key participants encompass vital parameters such as financial overview, company overview, business strategy, and recent developments. Primary research represents the majority of our research efforts, supplemented by a widespread secondary research. We reviewed key players’ product literature, annual reports, press releases, and relevant documents for competitive analysis and market understanding. Secondary research also includes a search of recent trade, technical writing, internet sources, and statistical data from trade associations, government websites, and agencies. This has proven to be the most dependable, effective, and dynamic approach for procuring precise market data, distinguishing business opportunities, and obtaining industry participants’ insights. Secondary research sources that are referred to include external patented databases, textbooks, financial reports, company websites, broker reports, commentaries, annual reports, stockholder presentations, and suitable patent and regulatory databases, statistical databases, and market reports, press releases, news articles, and webcasts specific to the corporations operating in the market. Secondary sources referred for this study include Chemical Weekly Magazine, ICIS Chemical Business Magazine, Hoover’s, Factiva and company presentations.